Well hello! How are you all? We have returned from a blissful holiday in France and are slowly easing ourselves back into normal life. It is all too tempting to show you Every Single Photo I took while we were away and I will try to spare you that - one chateau does begin to look a lot like another unless you visited them, despite their beauty - but I really want to share some of the best bits of our holiday with you because, my goodness, it really was a good holiday, probably the best one we've ever had as a family. Here are some postcards, if you will. A lot of these photos were taken on my phone, largely for convenience and practicality. It was often too hot to have a heavy DSLR around your neck. If you follow me on Instagram you'll have already seen a few photos, posted when I could connect to the temperamental WiFi in the bar, so I've tried to choose different ones here. The holiday began with the overnight ferry from Portsmouth to St Malo. 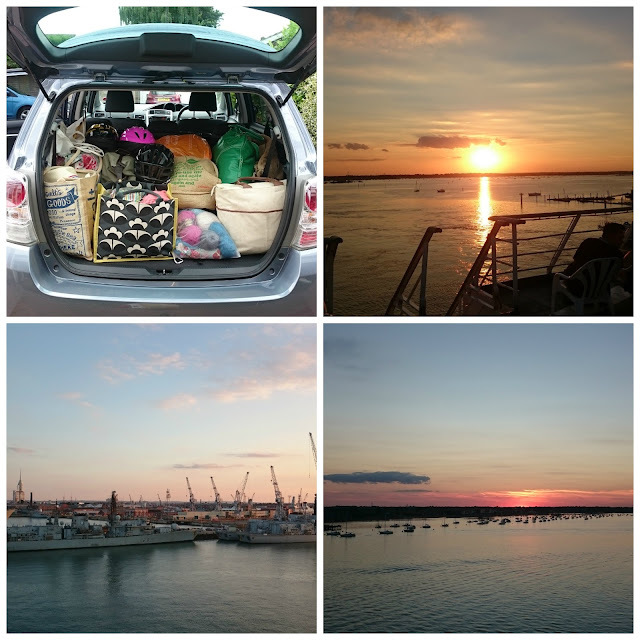 Highlights: the epic sunset and harbour views as we left Portsmouth, and the children's excitement. Low points: a really rubbish night's sleep and the children's excitement. 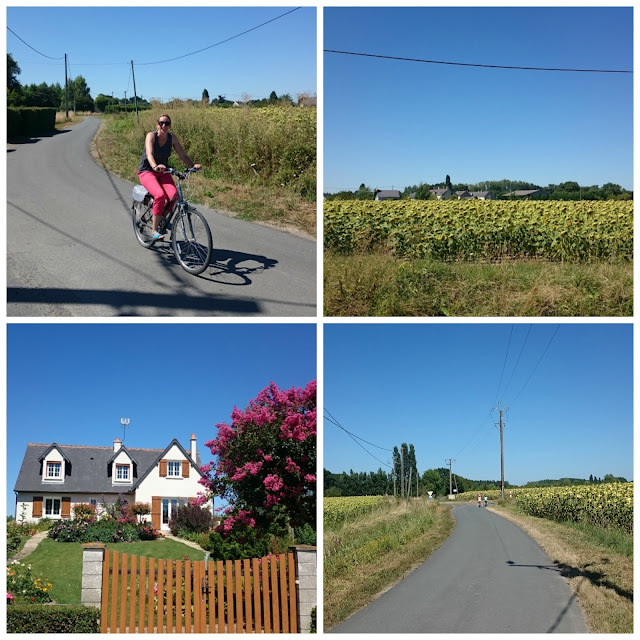 We stayed in the Loire Valley in a campsite near the town of Saumur. My parents were already on the site in their caravan, and my sisters and their families also rented mobile homes on the site while we were there. This is the ideal extended family holiday: everyone suits themselves with the daily practicalities of travel, shopping, cooking, sleeping etc, but we all spent lots of time together. We'd meet up at the pool every afternoon, hang out at each other's mobile homes in the evening. The children would all cycle off to the campsite playground to meet up with their cousins, leaving us free to read and drink wine.... Lots of space, the secret to a happy family holiday. 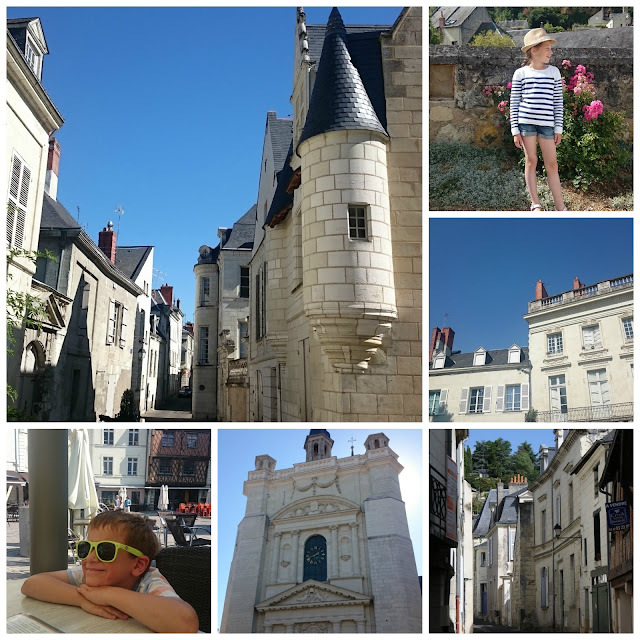 Our days fell into a pattern of going out somewhere for the morning before it got too hot, to explore a town or chateau, sometimes stopping for coffee or ice cream. 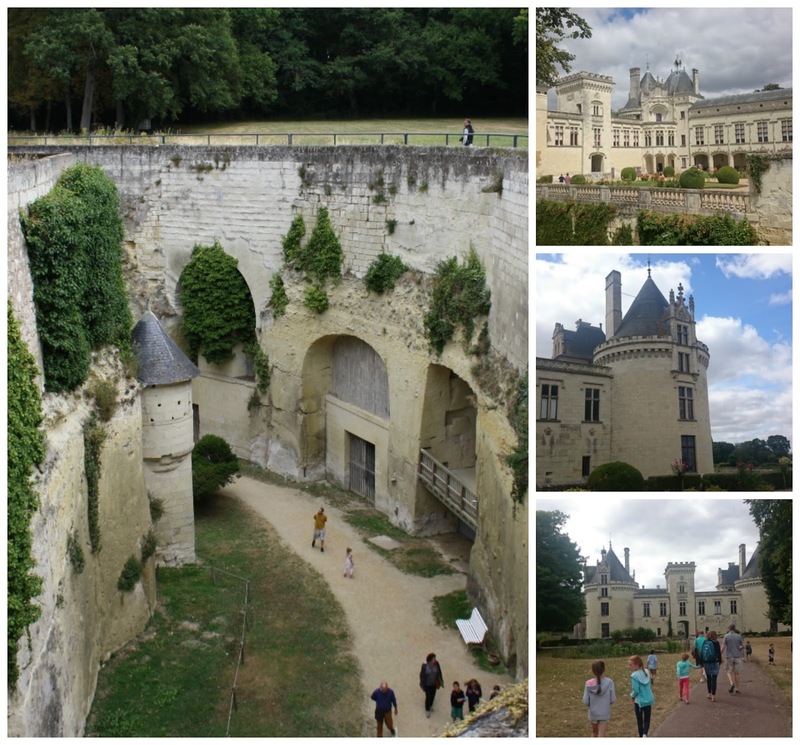 This area is full of chateaux and we couldn't see them all, hard as I tried. Some are more like our stately homes than what I would call a castle, while others are heavily fortified. Our favourite was Breze, with it's scarily deep moat and underground tunnels. We'd come home for a long lunch then spend some time relaxing (children do not seem to need to digest their food before running off to swim) before heading to the pool mid afternoon and staying there till maybe 6 pm. Then we would return for showers, start the barbecue, open the wine. We did have a couple of cooler days and on those we would go out all day, take a picnic with us. But the post lunch sit down was my absolute favourite time of day and it was just heaven sitting in the shade, stitching or reading. 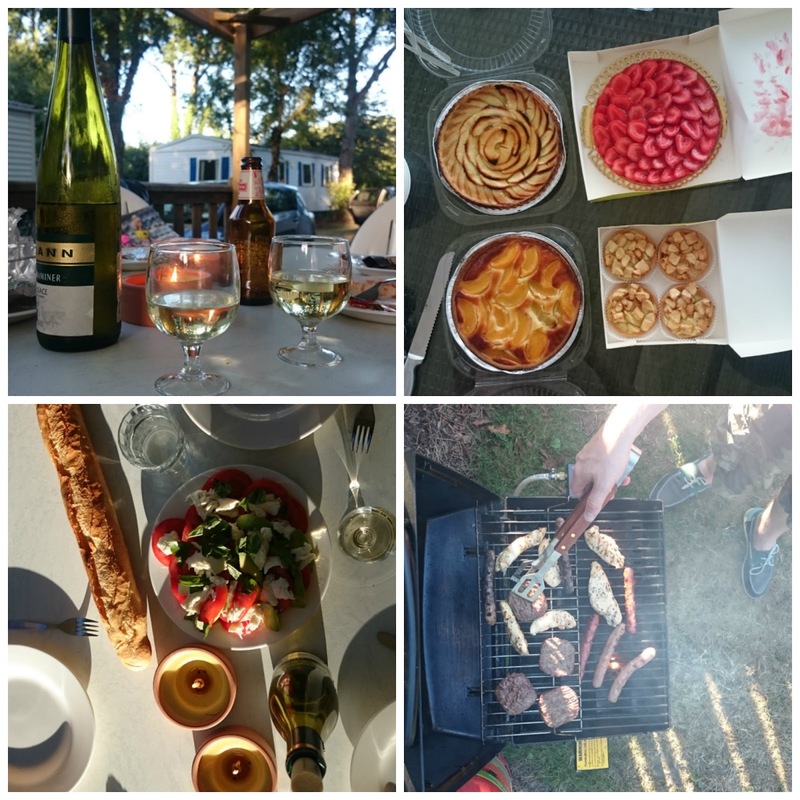 We did a lot of eating and minimal amounts of cooking. Bread, cheese and salad for lunch, barbecue and salad in the evening. Wine. Lots of wine. I love nothing more than exploring a foreign supermarket, looking at the different products and packaging. Highlights: the amazing selection of fresh, locally grown produce, the range of local wine, the patisserie, frozen macarons. We bought our daily bread in bakeries if we were out and about, or at the campsite shop if not. The bread, oh my goodness, so good. Whether you take your own tent or hire a mobile home or cabin, I think campsite life is pretty ideally suited to families. We took our bikes on the back of the car and Bella and Angus cycled all over the campsite whenever they could, and with a freedom that they just wouldn't have at home. They cycled more in ten days then they have in months, and it was wonderful for them and us. We did have a family bike ride around the quiet French lanes, in amongst the sunflowers, but it was extremely hot. It's such a pretty region, it's no wonder it's so popular. The old wooden doors, shuttered windows with their boxes filled with geraniums, the wrought iron balconies. 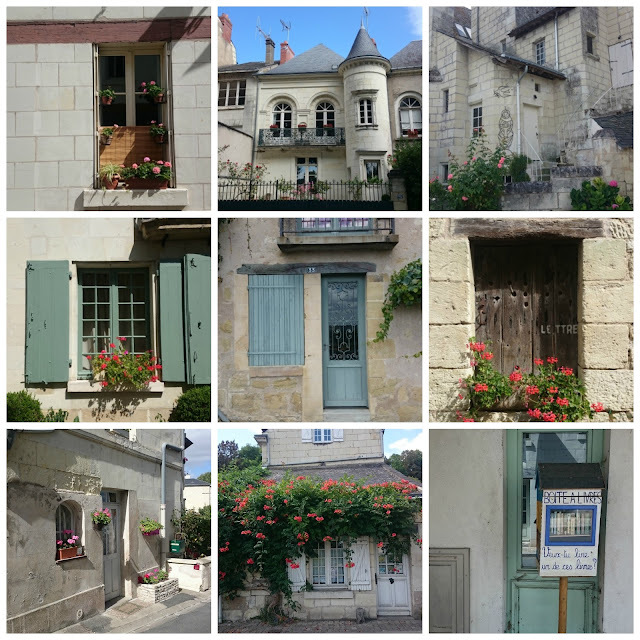 I took a lot of photos of doors and windows. I can't remember when I last felt so incredibly relaxed. deep down to the core relaxed. Part of that comes from having older children who don't need to be watched like hawks at the pool, who can swim and cycle well, read when they're bored, stay up later, sleep in later, and a lot of that is just the simple fact of being on holiday, but it was so good for us to have that family time together without the distractions of school, work, tv, internet. I thought I would have hours and hours to spend on crafting this summer. I was going to make four new cushions on my sewing machine with fabric from vintage sheets, I was going to make a macrame plant hanger, I was going to sort through my fabric stash and start making hexies for a quilt....not a chance. But I did manage to renovate a mid-century plant stand, and I will show you that soon. I have been working on items I already started, crafts which - once planned - require nothing of me, but just offer hours of relaxation. And isn't that just when crafting or making something is at it's absolute best; when, once the thought and planning is done, you just have the pure pleasure of building something beautiful with your hands while your brain wanders from here to there and your state of mind goes from overflowing and frantic to calm and quiet. I have worked a little more on this cross stitch sampler (available from here), completing two more motifs. You can get a sense of the overall balance of colour and pattern here. I am taking this on holiday with me and am looking forward to lots of time with this sampler, with a cold drink next to me, maybe a bowl of olives, while John cooks dinner on the barbecue and the children amuse themselves for hours on end and don't need endless applications of suncream (let have my dream). I am also working a little on Angus's blanket, here and there. I am starting to feel a little more warmth towards it now, perhaps because it's starting to grow a little. It is about the length of a scarf, a very wide scarf. I keep wrapping it around my neck, and it gave me an idea for something I'd like to crochet myself this autumn; a very long, very wide woollen scarf in the granny stripe stitch or something similar, very soft and drapey, the sort of thing you can envelop yourself in and wrap around your neck at least twice, and in shades of grey with maybe a little colour. It needs to be really good wool, soft and with a beautiful, subtle depth of colour, and of course I would need a lot of yarn for something so big, so I reckon this would be an indulgent kind of scarf to crochet myself, something quite luxurious. I don't know if I'll do it yet. 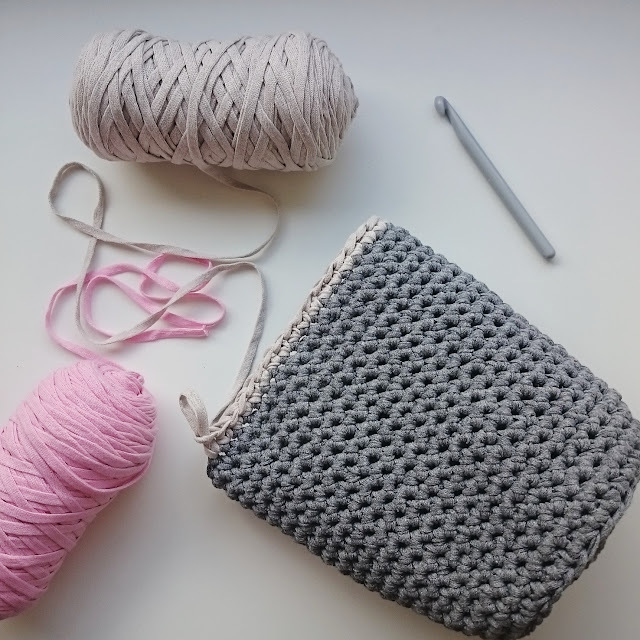 The other project I am working on is a crocheted bag to hold my yoga mat. With chunky yarn and a 10 mm hook this has been a speedy and enjoyable project. I wanted to address your wonderful response to my post In need of inspiration last month. I moaned about how nothing was grabbing me, craft wise, and how I was stuck in a rut, and you all came to my rescue with so many excellent ideas. I've tried to summarise them here. :: Crocheting clothes and bags. Yes, this is something I really want to do. I've made a poncho, but I think my skill level is up to something like a sweater now, and I even have a couple of patterns put aside. I daydreamed about making a cotton sweater this summer but it's too late now, but I definitely want to hook myself a pair of socks and a new hat this autumn, and maybe a bag too. :: Sewing clothes. I really would like to think that making some simple machine sewn clothes isn't totally an out of reach dream for me. Especially dresses. Being tall, I have a long torso and often find that the waist on shop-bought dresses sits one or two inches higher than I would want it too - being able to create some simple shift style dresses which take into account my shape would be wonderful. Also, embroidering clothes - it never occurred to me to do this, great idea! :: Sashiko quilting. Thank you to the person who told me about this. It's a Japanese craft of stitching a repeating pattern with white cotton onto indigo dyed fabric, traditionally to repair or reinforce worn clothing, but now as a decorative craft too. 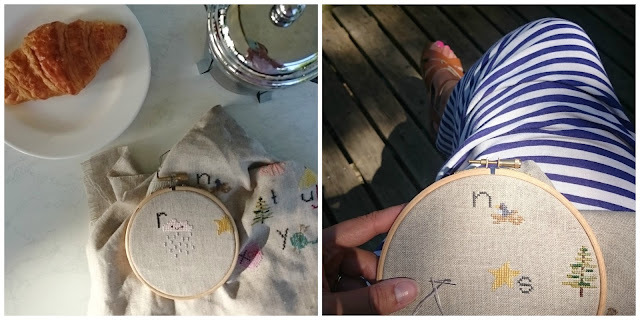 I just adore the look and simple aesthetic of this craft. There is so much scope here, particularly when I think about denim, but I don't know yet what to do with it all my ideas. :: Items for the home. So many possibilities. Cushions came up a lot - they are a versatile item and with quilting, tapestry, canvas work or crochet there are lots of options, although I think John might argue the need for more cushions in our house, we do have quite a few already. Also, table runners or table cloths and dish cloths - all very practical but open to all kinds of crafty ideas. :: Christmas. Practically my favourite crafting theme ever. Decorations, a Christmas tree skirt, stockings - I really want to do all of these things. Especially the tree skirt. You suggested Ravelry as a resource. I do browse this site sometimes, but find the scale of it and the number of patterns overwhelming. Also, Little box of Crochet. I didn't know anything about this until recently; it's a lovely idea, but currently there are no boxes available. Anyway, THANK YOU for your ideas and enthusiasm and support and for just being good people. I will be away from here for a couple for a few weeks but I'll be back soon, and hopefully with lots of sunny holiday photos to bore you with. We spent last Saturday at Mottisfont, a National Trust property near Romsey in Hampshire. 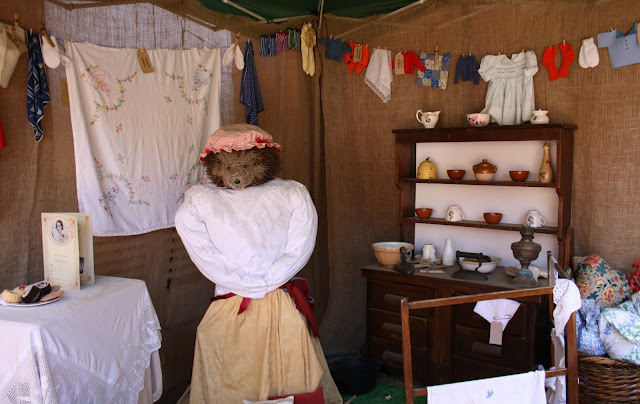 We last visited it between Christmas and New Year (and I wrote a little about it here) and while it was still beautiful in the middle of winter, I did very much want to return in the summer for two reasons; to see the roses, and to visit the Beatrix Potter exhibition. Neither disappointed. The weather was perfect, somewhere in the mid-twenties/high seventies, so hot enough to feel like summer but not so hot that we were all wilting. We took a picnic and spent the day with my parents and my sister and her family. I think all National Trust properties are lovely but there is something about Mottisfont that I like very much; it's small enough to see easily but big enough to spend a day exploring should you want to, rolling grounds lead down to a river, the walled garden is stunning (I do love a walled garden), and there are excellent trails and features for children to enjoy. Almost everything in the house can be touched and handled, and you never see a sign saying "keep off the grass" (unlike Hever Castle...). In conjunction with the art exhibition in the house, there was a charming Beatrix Potter trail that lead all around the grounds. You collect a map and pencil at the entrance and work your way around the twenty of so hidden doors, finding various things at each one; a clue to a puzzle you complete at the end, a challenge, a lovely display, Mr McGregor's Garden, a game - at each one something to do or find or enjoy. I don't think we finished the whole trail but it is a enchanting way to connect the exhibition indoors - which was very good but photography not allowed - with the landscape outside. And then the roses. You could smell them before you could see them and they were just beautiful. I know nothing about rose varieties but I know that I like the way they smell. There was a little ice cream stand at the entrance to the walled gardens and they were selling, among other things, rose flavoured ice cream. It tastes like Turkish Delight, floral and sweet and utterly delicious. Rose ice cream in the rose garden, that might be a highlight of the whole holiday. Do any of you know the children's book The High Street by Alice Melvin? It's a favourite of mine and Bella's (she still asks me to read it to her sometimes) and it's about a girl called Sally and her shopping list, and all the interesting people and things she sees on her local high street. The final item on Sally's list is yellow roses, but the florist doesn't have any, and she's sad until she walks into the park on her way home and sees an enormous yellow climbing rose, just covering the entire walls of the park. She can still enjoy them even though she can't take one home. It's the loveliest book, I can't recommend it enough. Anyway, this spectacular pink climbing rose reminded Bella and I of that straight away. It was pretty hot inside the walled gardens, sheltered as they are from the breeze, and absolutely humming with bees and butterflies. The scent of lavender here was everywhere. Many of the bushes had already bloomed and their flowers were brown and dry, but still full of that intoxicating smell. We walked down to the river in search of some shade and cooler temperatures. We were looking for the wonderful Wild Play Area, where children can paddle, pump and play with water. We did this in December with our wellies on, but it was even more fun in the summer, even if we did forget a towel to dry off wet feet. As I write this it's cool and grey, and my feet were so cold in my flip flops that I had to dig out my slippers. It doesn't feel very summery and I'm glad of my cup of tea. It's distinctly chilly in the mornings and evenings at the moment and, what with the blackberries appearing in the hedgerows, I'm reminded that we are now in late summer, and about to turn the page into autumn. 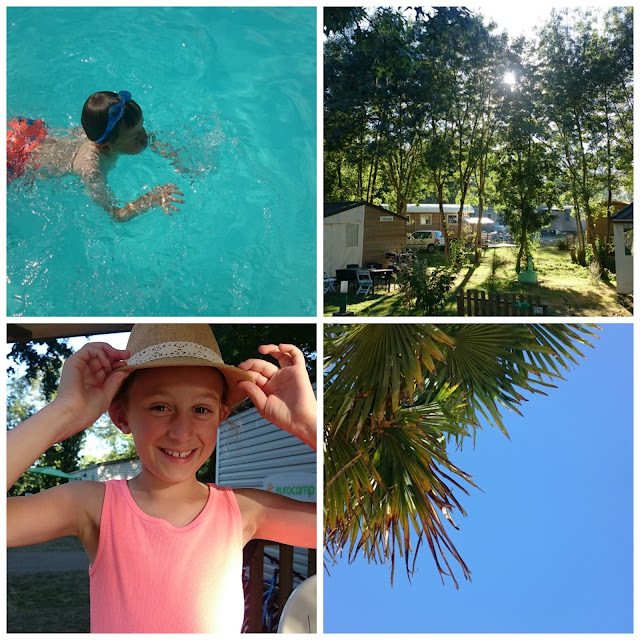 We are soon to have our holiday (I've checked and the weather in the Loire is currently around 30°C, ie. total bliss) and of course I don't want to wish away the summer, but I won't pretend I'm not looking forward to the changing of the seasons. Even with the inevitable return to school and work, I love the way summer slips away and autumn emerges. Thank you for your very kind comments on our kitchen-dining room. I'm really glad you all like it. I have appreciated your comments and interest so much throughout the whole building process - it really was like you were all cheering us on - and it was nice to be able to share the finished room with you. Hello lovelies! I hope you're all well. Thank you for your recent comments - I'm glad so many of you are also enjoying Stranger Things. We've had such a nice few days here; a day out to Mottisfont on Saturday, where the gardens were just so beautiful (I took a million pictures and will do a post about it soon) and yesterday and today we stayed at home, or very near home, pottering quite happily, running the odd errand. I did all my washing today. All of it, five loads, one right after other. The basket was totally empty (for about an hour, anyway), and I did all the ironing too, used up every last coat hanger in the house. I know. Let me just bask in that feeling for a moment... I also spent yesterday binge reading so many blogs and it was wonderful. The rest of this week will be more of the same I hope, doing jobs, staying home, visiting family, blog reading, getting ready for our holiday. I thought it was about time I shared some photos of our finished kitchen/dining room with you. A while ago, I showed you our newly fitted kitchen, but the dining end of the room remained bare and unfinished. We've been working hard on this over the last few weeks and it's pretty much finished now, and in constant use. That big grey expanse of wall has slowly and carefully been decorated with some framed pictures and prints. The family gallery wall has gone but all four of those images refer to places we've been (honeymoon, wedding anniversary trip, family holiday) and so they remain personal to us. I'm still not sure about the coastal print on the left - I think the colours are a bit cold for the grey wall. I'd like to make a woven wall hanging from yarn scraps, full of cream, pink, mustard and teal. I think it would look amazing against the grey. I especially love my little copper hanging planter - it adds a bit of warmth and colour to an empty corner by the door to the living room. Cookery books were dusted and sorted. This took a long time because I kept sitting down on the floor and reading them. But look at what they built! Isn't it the most gorgeous thing you've ever seen? Every time I walk past this it makes me smile. I love having our cookery books in the kitchen again. I've mentioned before how much we use them, how frequently they are consulted and read. I organised them by colour, for no good practical reason but it just makes me happy. It's funny to think there used to be a wall there. This is the view out towards the garden. Those patio doors are open most of the time and access to the garden is easy, which is handy when you're carrying plates of food. It is a lovely bright space benefiting from lots of natural light, and it's where I spend pretty much all my time during the day. The table is always in use, usually filled with a laptop, pens and paper, homework, magazines, cups of coffee, Lego, Hama beads. Sometimes we even use it to eat. But this is what we wanted so much, one room not just for cooking and eating, but for hanging out all together, warm and busy.